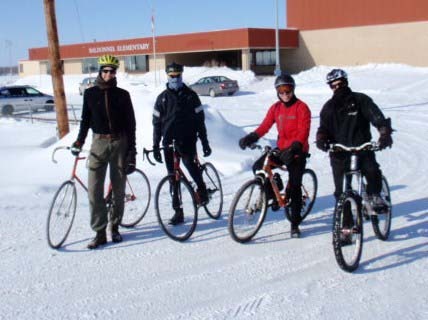 Sunday (March 13th) is the start of the Blizzard Bike Club’s tough, three race ‘Roubaix Cup’ Series, out in Baldonnel. The winter ‘Roubaix Cup’ Series events are legendary for having such bad weather since the series started 15 years ago, in 1996. 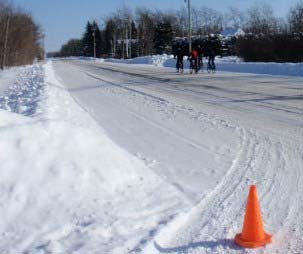 The Baldonnel Roubaix event has seen more than its fair share of extremely cold weather over the years ranging from -27 in 2002, -22 in 2003, five inches of fresh snow in 2004, and bone dry and +9 in 2005 and 2010! The weather is always a factor. The second race, the ‘Montney Roubaix’ race goes a week later at 2 pm at the Olde Montney Store. The weather for this one, last year, was -15 with a nasty north wind. The final race goes at Baldonnel School on the Baldonnel – Two Rivers loop. It was here Gary Hilderman sealed his 2010 Cup win in dramatic fashion after three time Cup winner Pat Ferris stretched out the pack on the first gravel hill, allowing him and Kevin Shaw to pull away for a lead of a minute. Gary Hilderman clawed his way back up to the leaders by the start of the Two-Rivers hill on the second lap and won the sprint from Kevin Shaw and Pat Ferris to get the overall lead for points. The Roubaix Cup is always a hard fought contest with other riders and the weather. Race time is 2 pm from the Baldonnel School. Dan Webster won Sunday's first race of the 2011 Blizzard Bike Club season. Pat Ferris was second. their time was 32:47 minutes for the 20 km loop. Ryan Dumaresq was third at 46:47 minutes. August Battiston had 33:02 for the 12 km distance. Conditions were chilly at -17 on the Baldonnel loop. Thanks to George Gamble for timing us! Coming up is the legendary Roubaix Cup series, which started back in 1996 and Jason Pearson the winner. Over the years Robert Martens has won a record four wins in this event with Pat Ferris winning three. The race conditions can be anything from cool, dry to a foot of snow, warm with mud and ice and as cold as -25 and anything in between. Sometime in the same series! The format is simple. The rider who wins the most points over the next three Sunday stages, wins. Gary Hilderman won last years edition with a dramatic finish line sprint to capture the trophy. Race conditions make all the difference. Snowy and cold conditions have worked well for Pat Ferris and Gary Hilderman while dry and fast conditions will favour George Gamble, Bob Andrews and Kevin Shaw. The weatherman will have a decision to make. Roubaix Cup #1 is Sunday at 2 pm at the Baldonnel School.